Several years ago, Steve Ballmer said Microsoft was all in on cloud, and the Windows Azure cloud service has become with one of its star products with updates every three weeks. But the company is apparently eager to get Windows Server more firmly established in the cloud. The new release, Windows Server 2012 R2, was announced this week at Microsoft's TechEd conference, and has a bunch of new features that place as much emphasis on syncing with Azure as on its use as an office server. It makes it possible to run servers as a managed, automated 'private cloud', using features in the upcoming System Center 2012 R2, move workloads to and from Azure, and build systems that share work between Windows Server and Azure. That's what Server and Tools Corporate VP Brad Anderson calls "consistency across clouds". "If things are consistent, if you have the same virtualisation, if you have consistency across data, you don't have to do any conversion, you don't have to do any migration, you have no friction," he says. 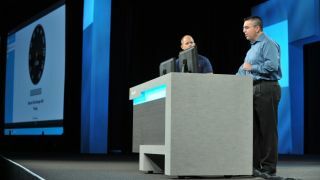 So Windows Server 2012 R2 will get many of the features of Azure through the Windows Azure Pack, including the self-service portal for managing and deploying applications and services, and the service bus that can connect those applications together into a workflow. Windows Server 2012 R2 and System Center use the version of Active Directory (AD) that runs on Azure to let you 'workplace join' Windows 8.1 notebooks and tablets so users can access files and resources on the company network. It is also possible to manage those devices by sending company software or locking down the Start screen so key apps are always in the right place, and new AD password sync tools to make it easier to move your existing AD onto Azure or keep a local and Azure AD in sync. The similarity between Windows Server and Azure means developers can use the new MSDN Azure credits to build and test software on Azure, including running load tests in the cloud straight from Visual Studio 2013, and then run them on your own servers. You can use any of your MSDN licences on Azure for testing Windows tools like SQL Server or SharePoint and MSDN includes credits for Azure services like running virtual machines, web sites and databases. The new Hyper-V Recovery Manager should make it easier to use Azure for disaster recovery for office servers. You can replicate content from servers in one office to those in another without having to copy it all it and out of Azure. You can also build a workflow for what happens if you run into problems and have to switch from one server to another. When the time comes you just choose the failover option in the Azure portal and the service makes the switch for you. Plus there is a version of BizTalk Server for Azure that you can use for exchanging documents securely with other businesses. It makes the process less expensive and complex, and it can connect to business applications like SAP running on the servers. Microsoft has added a lot of features to Windows Server 2012 R2 in the space of a year. Anderson puts it down to sharing the work with the management tools team. "One of the changes we made in our policies was we did common planning across Windows Server, System Center and Intune," he says. "We have common goals, common planning and common milestones so we can bring out more features more rapidly." Desired State Configuration in PowerShell 4, that lets you get the same results every time you run a script, even if the server configuration is different each time. Storage spaces tool in Windows Server 2012, for combining commodity drives into a pool of storage you can allocate like a single drive. Automatic storage 'tiering', in which frequently accessed data is automatically stored on faster SSDs in your pool to improve performance, is added by R2. Deduplication of virtual machines. Not only do you need less disk space but, according to Principle Programme Manager Jeff Woolsey: "Virtual machines running on deduped storage are loading over twice as fast, because we know where all the blocks are we can optimise intelligently." In addition, the 'shared nothing' live migration, that lets you copy a running virtual machine from one server to another without pausing, is also faster in R2. Microsoft noticed that most servers running virtual machines have spare computing capacity, so R2 uses that to compress the VM before it gets moved. With all these Azure features coming to Windows Server, and to the interfaces of hosting providers who offer Microsoft servers, the benefits of the cloud are being made available to boxed software. Will you see even more of Azure in Windows Server in future? "I can't talk about the future," Jeff Woolsey says, "but we want to deliver a consistent experience and consistent services."